Wounds that won't heal even after three months are considered chronic wounds. These wounds may start small as a scratch or a pimple but they continue to scab repeatedly and never get better. While a chronic wound can certainly cause several complications, you can always try some treatment options to make things more manageable. It is always better to consult your healthcare provider, but let's find out what steps you can take on your own. Many factors can affect the healing process of your wounds and turn them into chronic wounds. Here are a few of the reasons. One major reason why your wound is not healing completely is infection. Infection hinders the healing process and causes other complications. You may notice other symptoms such as a fever, change in size or color of the wound, increased pain, and yellow drainage from the wound. It is important to take oral antibiotics or use an antibiotic ointment to treat such wounds. Not eating a nutritious diet may well be the reason why your wound does not heal properly. Your body needs more vitamin A, vitamin C, zinc, protein, and overall calories to help heal your wounds. You need three times more protein than usual when you have a wound. Some of the best foods to eat during the recovery phase are beans, eggs, citrus fruits, broccoli, tomatoes, and red meats. If you continue doing an activity that has caused the wound, it is never going to heal completely. Ensure that your wound does not get rubbed against other surfaces. Many people who have wounds that won't heal smoke tobacco. Not only does smoking increase you risk of cancer, but it also affects the wound healing process. It happens mainly due to reduced blood flow to the skin caused by the nicotine in cigarettes. Taking certain medications may slow down the wound healing process. This usually happens when you take non-steroidal anti-inflammatory drugs, such as corticosteroids, anticoagulants, and immunosuppressive agents. Talk to your doctor about changing these medications when you think they are the reason why your wounds heal slowly. Your wounds may not heal normally when you have diabetes. In fact, sores in this case often lead to amputation. The most common reasons of developing chronic wounds in diabetic patients is that they lose feeling in their feet and feel nothing when they get small cuts, which eventually become infected. Wounds do not heal properly because there is insufficient flow of blood to the legs. And of course, your immune system will become weak due to diabetes, making it more difficult for your body to fight infections. These ulcers are responsible for most of the wounds you get on your legs. They develop after you have uncontrolled swelling in the legs. The wounds you get can be quite itchy and painful too. You will experience a feeling of heaviness in your legs because the blood fails to flow back up the legs. There will be some discoloration of the skin around your wound. You will require compression therapy to help make things better. Your wound may become irritated when you exert pressure on body tissue for an extended time. This is more common in wheelchair-bound or bed-ridden patients. Similarly, people with some form of dementia or those with spinal cord injuries are more likely to develop pressure ulcers. These sores usually develop on the sacral bone, tailbone, or heels. 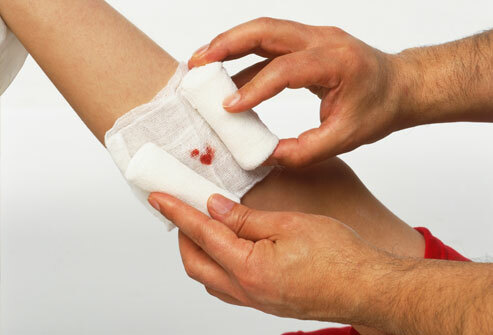 Keep your wound clean and flush it with sterile water to eliminate germs. Your doctor may also use a catheter tip for cleansing. Debridement is important to prevent infection. Your caregiver will remove any dead tissue or objects such as dirt or small rocks to keep the wound clean. It may also be important to clean out pus–your caregiver will do it for you. You may also have to apply bandages to avoid any bacterial infections. Wound dressings in the form of gauze, bandages, films, foams, and gels are equally important because they help prevent further infection and injury. They also help accelerate healing. Your doctor may put an elastic bandage around the wound area to help maintain some pressure on the wound, which reduces swelling. Negative pressure wound therapy (NPWT) may prove beneficial in some cases. It involves using a vacuum device to remove waste and fluid from your wound. It also helps pull the edges of your wound closer together, which promotes healing. Hyperbaric oxygen therapy (HBO) is a treatment option that involves giving oxygen under pressure to improve the level of oxygen in your body and promotes healing. The oxygen is given through a tube-like chamber called a pressure or hyperbaric chamber. NSAIDs: These medications help reduce pain, swelling, or fever. You can get them with or without your doctor's prescription. However, these medications can cause kidney problems or bleeding in some people. Do not take them if you are already taking blood thinner medicines. Acetaminophen: You may have to take these medications to reduce fever and pain. Follow the instructions on the label to avoid any complications such as liver damage. Antibiotics: Your doctor may prescribe antibiotics if your wound is not healing due to an bacterial infection.